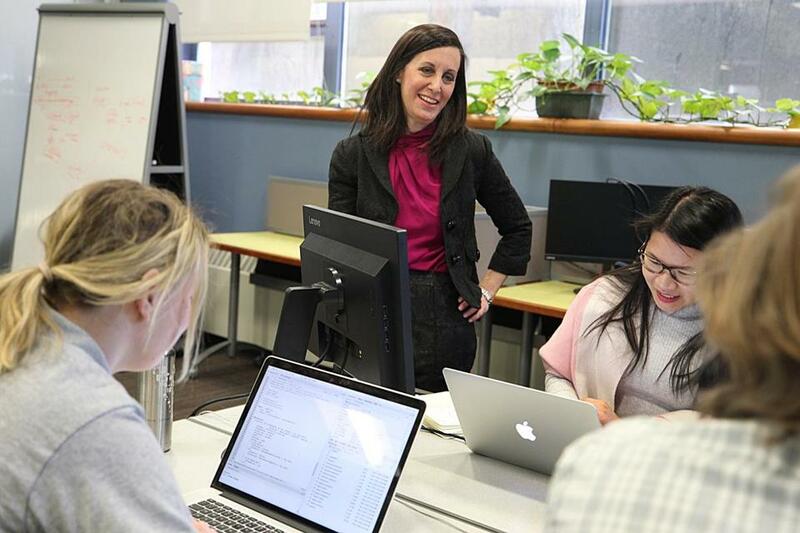 Shereen Shermak, executive director of the Boston Women’s Workforce Council, stood in the council’s workspace at Boston University’s Hariri Institute for Computing. 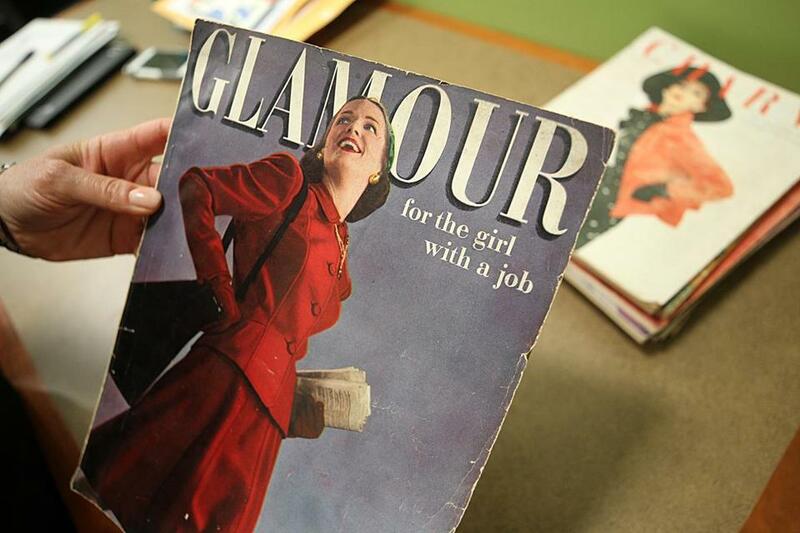 The mission of the Boston Women’s Workforce Council is to close the gender wage gap. So why is its office located in the computer science wing at Boston University? The answer lies in the highly sensitive wage data that the council collects from local companies to analyze the differences between men’s and women’s salaries. To get access to this information, employers had to be assured that their payroll data would be completely anonymous, even to the council itself. Enter BU’s Hariri Institute for Computing, which created a program that aggregates companies’ wages without storing or revealing identifying information. And as the institute seeks to expand this technology for other uses, the Women’s Workforce Council serves as proof of how it works. The ecosystem at the Hariri Institute is decidedly tech-y, with bright green walls, glass-partitioned offices, and frosted panes of glass covered with equations. Shermak’s office just down the hall is far more bare-bones. She and her staff — a marketing and events manager and an intern, whom Shermak is hoping to bring on full time — sit at tables in a small room off the corridor, where they are often interrupted by lost visitors looking for directions. 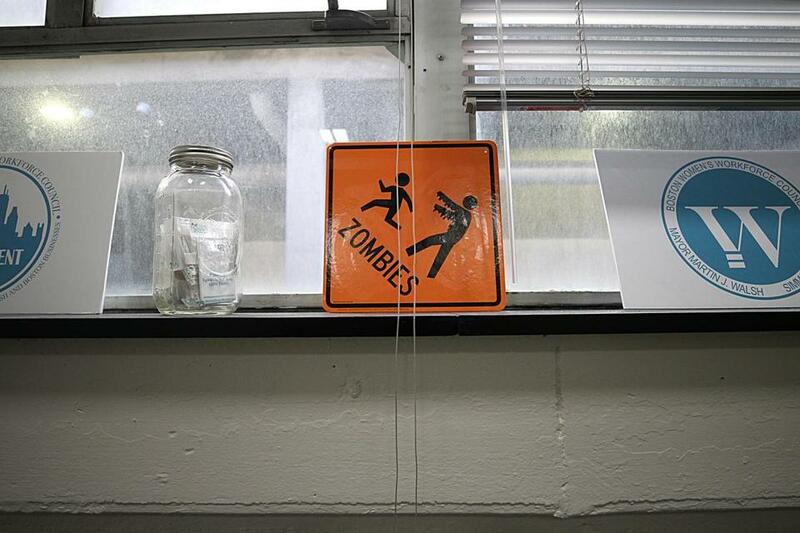 An orange construction-zone-like sign with the word “zombies” and a figure with outstretched arms chasing a smaller figure sits on the windowsill — left over from a Halloween party. The view through a dust-caked window is of a parking garage, and a box of snacks from the snack delivery company Boxed — pretzels, Pirate’s Booty, Cheez-Its — sits on the floor in the corner. An orange construction-zone-like sign with the word “zombies” and a figure with outstretched arms chasing a smaller figure sits on the windowsill — left over from a Halloween party: “We never wanted to take the zombies sign down,” Shermak says. Lining the walls are posters from other past events featuring quotes and magazine covers about working women from the 1940s and ’50s. “Not a ton has changed,” Shermak notes wryly. The Women’s Workforce Council — a public-private partnership created by the City of Boston and funded by dues from the now 250 companies who have signed on to reduce the wage gap — is gearing up for its third round of data collection this fall. The first report, issued in 2017, found that women in Boston made 77 cents on the dollar compared with men, based on wages from 69 companies — not accounting for differences in occupation, education, and experience. The second one found that women made 76 cents for every dollar men make, based on data from 114 companies. The data provide the first-ever look at pay gaps based on information provided directly from employers, as compared with estimates from workers, using encryption technology called multiparty computation, or MPC. Hariri is exploring other ways to use the program, such as by pooling confidential medical data from patients in Boston and India to advance diabetes research. The Women’s Workforce Council’s involvement has helped Hariri figure out how to make its technology more practical and accessible for other organizations, said Azer Bestavros, the founding director of the Hariri Institute. And when Shermak has a question, she can just walk into Bestavros’s office — a well-lit corner space overflowing with plants — and ask him. “There’s a lot of great back and forth,” she says.